Inconceivable! Win "The Princess Bride: 25th Anniversary Edition Blu-ray"
On October 2nd, Fox is releasing the 25th Anniversary Blu-ray edition of the classic comedy/fantasy film, The Princess Bride. On October 2nd, Fox is releasing the 25th Anniversary Blu-ray edition of the classic comedy/fantasy film, The Princess Bride. One of the most beloved films of all time, The Princess Bride, which features a stellar cast and a great soundtrack by Mark Knopfler, has only grown in stature an popularity as the years have passed. Directed by Rob Reiner (The Sure Thing, Stand By Me) and written by Academy Sward winning screenwriter, William Goldman, The Princess Bride cuts back and forth between reality, where a sick boy (Fred Savage) is being read a book by his kooky grandfather (the great Peter Falk) and the fantasy world where the story come to life. The fantasy story stars Cary Elwes as young Westley, a farm hand who falls in love with the bratty Buttercup (Robin Wright, in her film debut). Whenever she commands him to do a chore, he replies, “As you wish.” Eventually they fall in love and Wesley sets off to make some money so they can marry. When Buttercup learns that Wesley has been killed by the Dread Pirate Roberts, she decides to marry King Humperdinck (Chris Sarandon at his slimy best). The Dread Pirate Roberts returns, but he’s really Westley, and the two of them flee from Humperdinck, only to be chased by a criminal genius (Wallace Shawn) who finds everything “inconceivable,” a giant with a penchant for rhymes (Andre the Giant) and a Spanish master of the sword who has sworn to avenge his father (Mandy Patinkin). There is also a six-fingered man (Christopher Guest), an ancient wizard and his haggard old wife (Billy Crystal and Carol Kane), a clergy with a speech impediment (Peter Cook) and rodents of unusual size. Phew! ALL NEW – TRUE LOVE: THE PRINCESS BRIDE PHENOMENON (Pts. 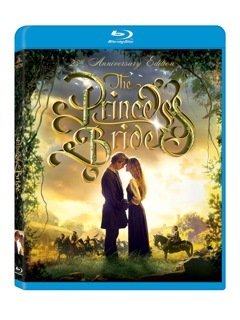 1 & 2) For 25 years, viewers have watched and loved The Princess Bride. But why does it resonate so strongly for all ages? This two-part featurette offers some answers, along with funny and touching tributes from its cast, director, writer and fans. Part 1: TRUE LOVE: THE PRINCESS BRIDE PHENOMENON – A Conversation with Rob Reiner, Cary Elwes and Robin Wright. The director and his stars reunite for this lively discussion of the film’s 25th anniversary, favorite fan encounters and memories from the set, illustrated by never-before-seen dailies. Part 2: TRUE LOVE: THE PRINCESS BRIDE PHENOMENON – Hear from the film’s creators and cast, passionate fans, and see film tributes and parodies, as we explore why the movie became a phenomenon. Interviewees include Rob Reiner, Cary Elwes, Robin Wright, Billy Crystal, Mandy Patinkin, Christopher Guest, Chris Sarandon, writer William Goldman, executive producer Norman Lear, Rob’s father Carl Reiner, and more. The Princess Bride is a classic fairy tale that continues the tradition of fantasy films of the 80’s that featured wonderful effects and a great mix of comedy and adventure. Films like Jim Henson and Frank Oz’s 1982 magical story, The Dark Crystal, which details the birth of two new races, the vulture-like Skeksis and the Mystics. While the two groups battle each other, we come to find out that two Gelflings – a race that was thought to have died off – have survived and must work to bring peace to their new world. Then there is 1984’s The Neverending Story, about an unhappy boy is bullied by other kids and hides in a bookstore. There, the shopkeeper gives him a magic book, which allows the reader to become part of the magical story. After The Princess Bride, we saw such fantasies as the George Lucas/Ron Howard collaboration, Willow (1988), starring Warwick Davis as thte titular charcter, and Nelwyn who finds a child that was prophesized to cause the downfall of the evil queen, and a swordsman (Val Kilmer) who helps Willow. Then there was 1996’s Dragonheart, starring Dennis Quaid, David Thewlis, and the voice of Sean Connery. Dragonheart is about a 10th century knight (Quaid), who forms an alliance with the last remaining dragon, Draco (voiced by Connery), to perform staged dragon slayings in order to collect rewards. Finally, there is Big Fish, Tim Burton’s 2003 fantasy drama with a fantastic cast, including Ewan McGregor, Marion Cotillard, Steve Buscemi, Danny DeVito and Helena Bonham Carter, Big Fish is the story of a dying man telling his son tall tales from his exciting life. His fantastic stories involve great characters, like witches, giants, Siamese twins and a bank robber, all depicted in typical Burton style. Who co-wrote the love theme from The Princess Bride, “Storybook Love,” with Mark Knopfler? Email you answer to Malchus@popdose.com by 5 PM ET this Friday (10/5/12). Good luck!